[S154] 1860 US Census, Town of Meridian, Bosque, Texas. [S392] Website findagrave.com (http://www.findagrave.com/) "# 40003370." [S189] Frederick A. Virkus, Abridged Compendium of American Genealogy, Vol. 4. p. 693. [S89] Family Search, Texas, Deaths, 1890-1976. [S83] NEHGR, Vol. 44 p. 58. [S143] Henry Edward Chetwynd-Stapylton, Chetwynds of Ingestre, p. 32. [S143] Henry Edward Chetwynd-Stapylton, Chetwynds of Ingestre, p. 33. [S343] Ruth Story Devereux Eddy, The Eddy family in America, p. 1063. [S205] Newspaper, Bath Chronicle and Weekly Gazette, 23 January 1890. [S460] MI, "Dryburgh Abbey, gravestone." [S205] Newspaper, The Scots magazine and Edinburgh literary miscellany, Volume 68, Part 1. Child of Sarah Erving and Samuel Waldo Jr.
Carl Espenson married Mabel Peterson. [S232] Ancestry.com, Web: Minnesota, Birth Index, 1900-1934. [S392] Website findagrave.com (http://www.findagrave.com/) "# 30511862." [S230] James Rindge Stanwood, Ancestry of Jacob Wendell, Tabular chart. [S232] Ancestry.com, Vermont, Death Records, 1909-2008. [S591] 1921 Canadian Census, Ontario, Simcoe East, Orillia. The marriage of Charles Evans and Alman Seddon was registered in the quarter ending December 1881 in the Birkenhead registration district. [S207] 1910 US Census, Precinct 6, Washington, District of Columbia. [S94] 1891 British Census, Class: RG12; Piece: 1313; Folio 109; Page 11; GSU roll: 6096423. [S467] Website USGenWeb (http://www.usgwarchives.org) "http://files.usgwarchives.org/fl/martin/bios/…." 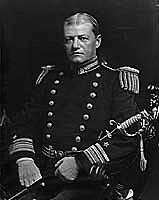 Rear-Admiral Robley Dunglison Evans was born on 18 August 1846 in Floyd County, Virginia. He married Charlotte Taylor circa 1870.2 Rear-Admiral Robley Dunglison Evans died on 3 January 1912 in Washington, District of Columbia, at the age of 65.